CCTV footage of shootout at a petrol station in Atlanta, Georgia, shows a man with blonde hair entering the petrol station's store. As he leaves, another man who has just arrived begins following him. The blonde man then goes to the driver's side of a black car and pulls out an AK-47 pistol. He chases the other man around the car, gesturing with the gun as the other man holds his arms up in defence. 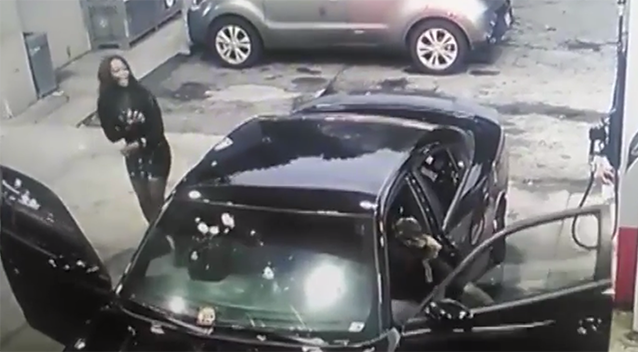 The blonde man then fires a barrage of bullets into the car's windscreen towards the man, as the fierce shootout unfolds. Bullets are sprayed across the car's hood, littering the concrete with debris and broken glass. 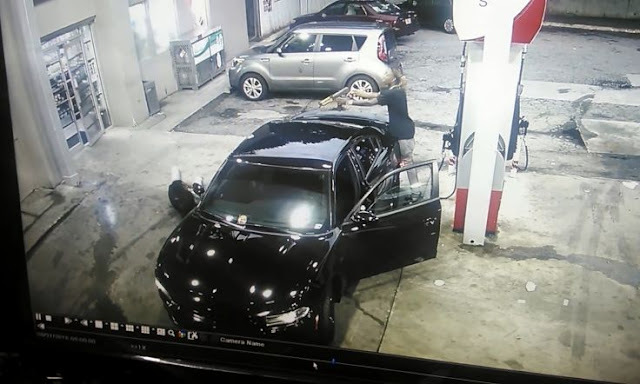 As the shooting dies down, a woman can be seen getting out of the vehicle and clutching at her shoulder. The blonde man, another companion and the woman then all flee the scene. The car is left a busted mess, doors open and bullet holes punctured across the bonnet and windows. According to International Business Times, local media reported that Atlanta Police said the woman sustained a gunshot wound to her left shoulder. She is reportedly in a stable condition in hospital. Police are seeking a description of the suspect who fled the scene in a red and black Mazda. A motive for the incident is also being determined.